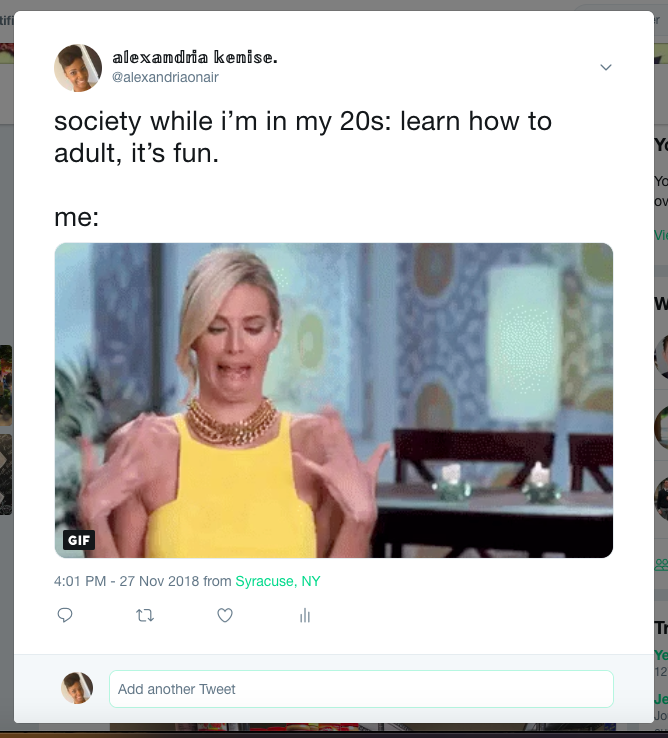 Background: The tweet pertains to the struggle of adulting in your 20s. I respond to society via the emotions of a gif. The gif and the topic chosen is relatable to many millennials that are not about that adulting life and would rather have the responsibilities that come with adulting, to stay far away from them. Goals: The primary goal of this campaign is to make millennials feel they’re not alone. The secondary goal for the campaign is to not only be relatable, but humorous. Objective: My target is to engage with users and tweets of similar content to increase traction of the campaign. I also would like to start a conversation about what adulting is like for other millennials and what they find is and isn’t working for them in the midst of their transition. Metrics Report: I received 2 engagements. What worked and what didn’t: It honestly doesn’t seem like the whole campaign worked at all with such a low number of engagements. I’m not sure if it’s because I have a low follower count, but it’s probably because I wasn’t consistent in promoting the tweet or sharing it with friends. I had a goal of letting it gain attention on its’ own because I feel like that’s the best way for content to naturally go viral. Moving forward I see it’s necessary to promote your content so that it can gain traction and people will engage with what they find interesting and relatable.